The Drone is unlike any other climbing treestand on the market, it will allow you to extend or retract up to 5 inches of cable with the turn of your wrist. 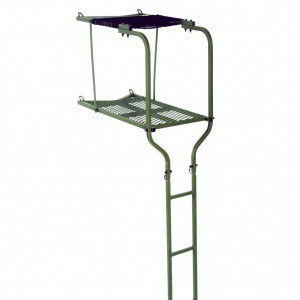 This climber is the safest and fastest way to level your treestand while climbing. 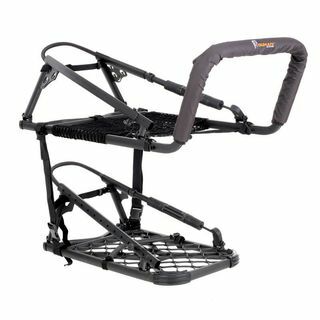 The new climber retains many of the classic OL’MAN features but incorporates new oval tubing and an improved cable system. With fluorescent cable heads for easy assembly in the dark and oval tubing the Drone eliminates the need for twisting a cable to align with the hole. The new climber also has built in accessory holders on either side for range finders, binoculars,rattling horns, ect…. The unique pivot arm design on the Drone will also allow it to pack up less than 4 inches thick. The Drone is also three stands in one which allows the hunter to have a shooting rest, a straight bar, and a foot rest. The Drone includes the Comfortech net seat which is the quietest and most comfortable seat on the market. The Drone is rated for 300lbs.